We know milk’s nutrient value is unmatched by soy, nut, and other alternative beverages — but do we know what those alternatives taste like? Last week, I attended the Inaugural Dairy Experience Forum, a conference on engaging today’s consumers to build dairy demand. A session about nondairy beverages, presented by Lloyd Metzger, Director of Midwest Dairy Foods Research Center at South Dakota State University, gave dairy farmers, industry people, and myself an experience to do something we would have probably never done on our own . . . taste plant-based alternative milk beverages. All of us, as dairy farmers and industry people, know the importance of milk in the diet. We know plant-based drinks do not have the equivalent nine essential nutrients in an 8-ounce glass. But, not all of us can say we know what these alternatives taste like. Taste is arguably the number one reason people choose to drink or eat what they do. If a consumer asks you, “Have you ever tried soy milk?” and you reply “No,” but then proceed to talk to them about how it has a low nutrient value, high sugar content, and essentially is not the best option . . . they may think you are ignorant and don’t sound very trustworthy. The beverages we tried included soy, almond, cashew, peas, and coconut. None of them had as appealing of a taste as milk. We also tasted teas, flavored water, and energy drinks because all of these products are competing with milk, especially milk consumption among children and teens. Something Metzger eluded to is that plant-based alternatives offer people more choices for flavors and sizes. It’s true. For the most part, grocery stores carry gallon or half-gallon white, chocolate, and, if you can find it, strawberry milk. Alternative milk beverages may not be up to par with milk’s taste, creaminess, or nutrients, but in a matter of time they will figure it out. 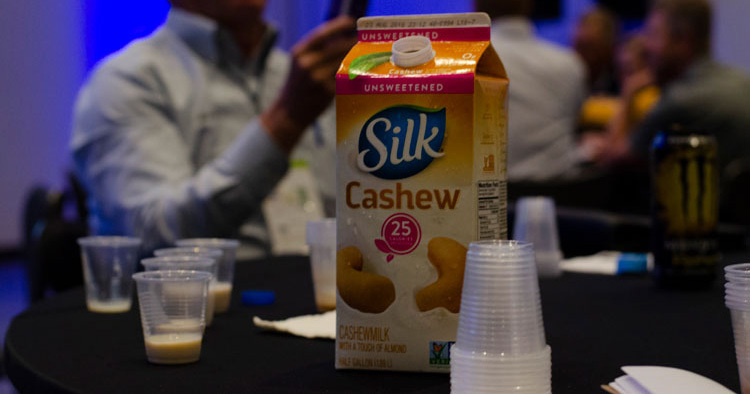 New innovations in fluid milk flavors, packaging, and labeling will all be pieces to the puzzle of increasing fluid milk consumption before we lose more customers to alternative beverages. At the least, we can all do our research on milk alternatives, and yes, actually taste them. Christy Achen is the 2018 Hoard's Dairyman summer editorial intern. She grew up on a dairy farm in southwest Kansas. Achen is currently a senior at Utah State University studying agricultural communications and journalism.